Starting with M62, V8 switched the default algorithm for collecting the young generation to a parallel Scavenger, similar to Halstead’s semispace copying collector with the difference that V8 makes use of dynamic instead of static work stealing across multiple threads. In the following we explain three algorithms: a) the single-threaded Cheney semispace copying collector, b) a parallel Mark-Evacuate scheme, and c) the parallel Scavenger. Until M62, V8 used Cheney’s semispace copying algorithm which is well-suited for both single-core execution and a generational scheme. 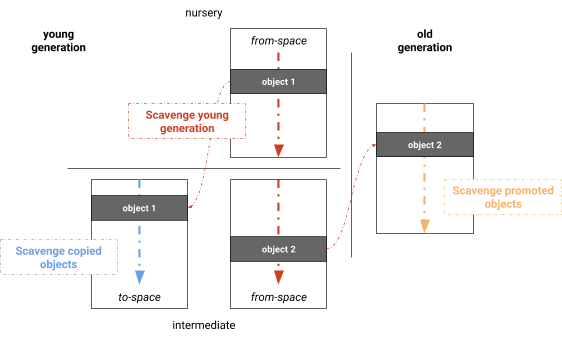 Before a young generation collection, both semispace halves of memory are committed and assigned proper labels: the pages containing the current set of objects are called from-space while the pages that objects are copied to are called to-space. 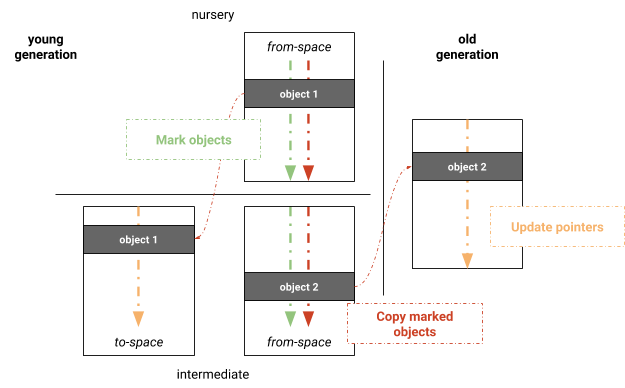 The parallel Mark-Evacuate collector separates the phases of computing liveness, copying live objects, and updating pointers. An obvious optimization is to merge these phases, resulting in an algorithm that marks, copies, and updates pointers at the same time. By merging those phases we actually get the parallel Scavenger used by V8, which is a version similar to Halstead’s semispace collector with the difference that V8 uses dynamic work stealing and a simple load balancing mechanism for scanning the roots (see Figure 4). Like the single-threaded Cheney algorithm, the phases are: scanning for roots, copying within the young generation, promoting to the old generation, and updating pointers. We found that the majority of the root set is usually the references from the old generation to the young generation. In our implementation, remembered sets are maintained per-page, which naturally distributes the roots set among garbage collection threads. Objects are then processed in parallel. Newly found objects are added to a global work list from which garbage collection threads can steal. This work list provides fast task local storage as well as global storage for sharing work. 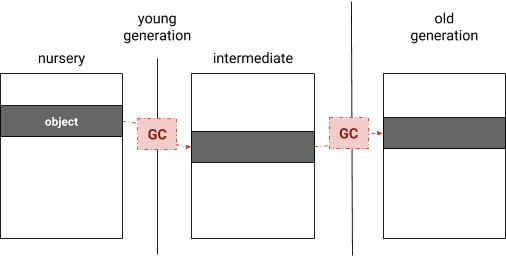 A barrier makes sure that tasks do not prematurely terminate when the sub graph currently processed is not suitable for work stealing (e.g. a linear chain of objects). All phases are performed in parallel and interleaved on each task, maximizing the utilization of worker tasks. 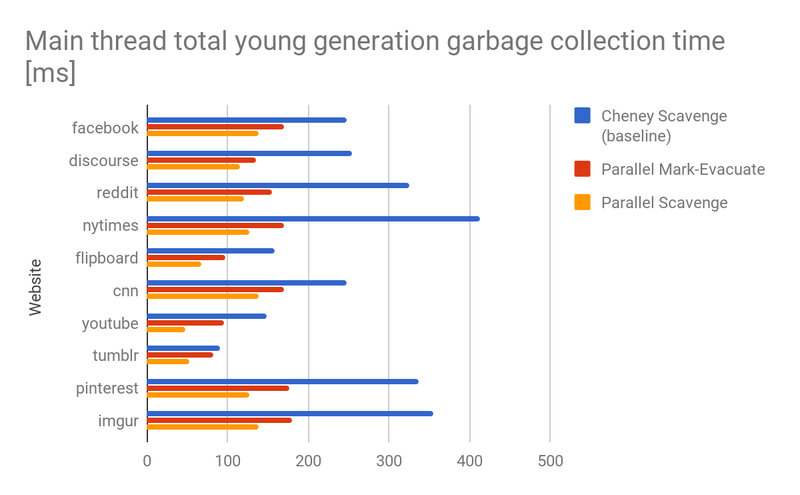 V8 now ships with the parallel Scavenger which reduces the main thread young generation garbage collection total time by about 20%–50% across a large set of benchmarks (details on our perf waterfalls). Figure 5 shows a comparison of the implementations across various real-world websites, showing improvements around 55% (2×). Similar improvements can be observed on maximum and average pause time while maintaining minimum pause time. The parallel Mark-Evacuate collector scheme has still potential for optimization. Stay tuned if you want to find out what happens next.